If you fancy some beach-time – complete with swimming, big surf, and seaside camping – check out this road trip along the North Island’s west coast. 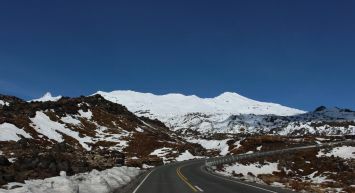 It dishes up buckets of interesting scenery and sandy beaches in spades, with the bonus of remarkable caves, a memorable ‘forgotten’ highway, and national park with a striking volcano in the middle. The trip can be finished at New Plymouth, or continued along a cruisy surf highway. 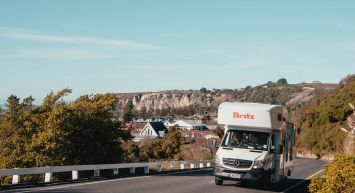 To sample the City of Sails before hitting the road, overnight at Manukau Holiday Park, 15 minutes’ drive from the Britz Depot, and catch a bus to downtown Auckland. Once you’ve wandered Queen Street and the waterside Wynyard Quarter, set your sights on Auckland Art Gallery or Museum, Ponsonby’s restaurants and bars, or cruise over to the volcanic island of Rangitoto. Head south on SH1, then west via SH23 to Raglan, around two hours from Auckland. A sweet little town sprinkled with ‘endless summer’ vibe, Raglan is famous for its surf beaches. Manu Bay is rumoured to have the world’s longest left-hand break, while nearby Ngarunui is a lovely place to while away a day, playing in gentler waves. Watch the sunset from Raglan Kopua Holiday Park, right on the beach and five minutes’ walk to town. The most scenic road to Waitomo Caves is via Kawhia Road, although note that 22km is unsealed. Stop at Waireinga/Bridal Veil Falls and linger awhile in Kawhia, a small harbourside town with interesting Maori history. Take the Harbour Road to Te Anga for the turn off to Waitomo. Stop at Marokopa Falls and Mangapohue Natural Bridge, two eye-popping surprises that will whet your appetite for Waitomo Caves. View this amazing subterranean wonderland on a walking tour, or go for full immersion on a Legendary Black Water Rafting trip. Recover from all this excitement in the park-like surrounds of Waitomo Top 10 Holiday Park. Head south via SH4 to Taumarunui, the start of SH43, the Forgotten World Highway. This is a quiet and scenic but winding countryside route, so drive slowly, savouring the ups and downs. Stretch your legs at various lookouts, waterfalls and other points of interest, and enjoy a meal at the Whangamomona Hotel, a memorable heritage pub in the heart of the Forgotten World. Admire majestic Mt Taranaki along the final stretch of SH43 and SH3 to New Plymouth. The region’s capital treads an enviable line between busy industrial service centre and vibrant small city, offering plenty of hospitality and a walkable waterfront. (Belt Road Seaside Holiday Park has amazing cliff-top views.) Don’t leave town without visiting Puke Ariki museum, and Pukekura Park – regularly touted as New Zealand’s best public gardens. It’s also just half an hour’s drive to Taranaki/Egmont Visitor Centre, high on Mt Taranaki’s slopes. It’s a great place to learn about the national park before setting off on one of many view-filled walks. The 105km-long Surf Highway 45 skirts around South Taranaki’s semi-circular coastline between New Plymouth and Hawera, with the volcano a constant companion. Heaven for surfers with consistent Tasman Sea swells, the coast also offers plenty of swimming, walking, and other seaside activities. Just 11km south of New Plymouth, Oakura is a family friendly hotspot, with fun waves, summer lifeguard patrols, cafes and shops, plus waterfront camping at Oakura Beach Holiday Park. Fifty kilometres south, weeny Opunake is waxhead central come summertime, so book in advance to camp at Opunake Beach Holiday Park – a gorgeous spot close to coastal walkways. 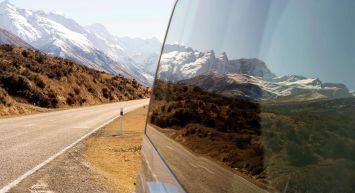 The most scenic route south from New Plymouth is via Surf Highway 45, which ends at Hawera from where you can keep trucking south to Whanganui, or head north through Tongariro National Park towards SH1. SH3 via Stratford cuts the driving time south to Hawera by about 40 minutes. Other than retracing your journey back along the Forgotten World Highway, the other way north is via SH3 towards Mokau, a fairly slow road with coastal and rural scenery that re-enters civilisation at Te Kuiti.